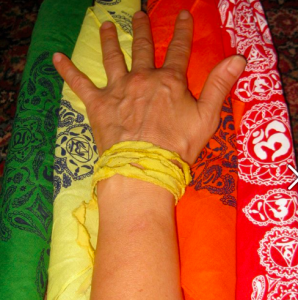 The eastern tradition of the chakra system teaches us that along the vertical core of our bodies, we each have seven subtly spinning energy centers which span from the base of the spine to the crown of the head. Ideally these little wheels are supported perfectly, providing us with a balanced state of emotional, physical and energetic health. However, life happens: both internal patterns and external situations such as physical tensions and other stressors can cause excesses, deficiencies and blocks in these centers. Whether a result of a recent occurrence or a childhood trauma, a yoga asana practice tailored to address our chakra imbalances can be an effective approach to transformation, integrating our physical body with the energetic world within and around us. Along with yoga, there are many other ways in which you can support your body’s energetic centers. 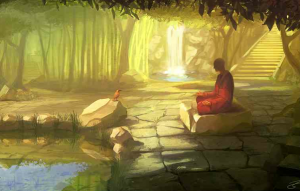 Meditation can help you to tune into any imbalances you may be experiencing so that you may work to create harmony. In addition, by tapping into these centers through journaling, art and conscious awareness of them, you can empower yourself to release blocks that may be holding yourself back from expressing yourself fully and authentically. When you tune into your body’s subtle energy field and bring it into harmony with your physical being, you are able to see patterns of behavior and emotions that are holding you back. You are also able to recognize your strengths so that you can learn to work with them to support you on your path. With this awareness, it is then possible to break through your own barriers so that you may fully actualize yourself. I was only about 29 yrs old when I discovered I had hepatitis C. At the time I was a single mom to a 5-year-old, owner of a successful business, and going through a difficult breakup. I thought my life was over. After surviving my years as a party girl and breaking free from an abusive relationship, I thought I had no more worries. And then this: a death sentence…or so I thought. The emotions where overwhelming, flooding me with despair, fear, anger, and resentment. I felt stuck, and I was; at least at first. It wasn’t until I was willing to face these feelings and become proactive in my own life that I was able to begin a path of healing and wellness. While I had no real knowledge of the chakra system back then, I see now how my process was about first grounding myself at a physical level. I asked for help and found an integrative doctor and a homeopath to get me from a desperate survival mode to a feeling alive and open. With this stability, I was able to heal, and other people and situations appeared to me due to my willingness to see them. I cleaned up my diet and my lifestyle, began to move and breathe with exercise and yoga, and perhaps most of all, the process of self-forgiveness and compassion began. It’s been many years, and now in my late 40s I can look back to see that not only has it been a non-linear path, it’s been a process that truly never ends: new layers, discoveries, and epiphanies continue. 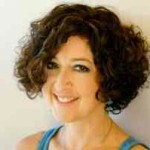 Join Lisa Cohen and Janet Raftis this June 8th in an empowering and uplifting workshop. 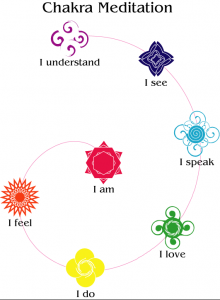 Unlock Your Power through an Exploration of Your Chakras will lead you through yoga, journaling, art and meditation to activate your connection with your energy system and provide you with insights that can create major breakthroughs. We conclude the workshop with a healthy vegetarian chakra balancing lunch. For more information, reach out [below] to Lisa Cohen directly. A single mom, Atlanta native, and owner & operator of online vintage jewelry business for nearly 3 decades, the Family Jewels. Lisa came to yoga a decade ago for the vanity and stuck around for the sanity. After a few years of a dedicated daily hot yoga practice, Lisa found herself leading a yoga class when the instructor overslept, and her passion for teaching was discovered. She went on to earn her 200-hour yoga teacher certification in Pranakriya Yoga and additional certifications in Grounded Yoga, Radiant Child Yoga, Street Yoga, Lisa continues to study, always the student and has foundational training in yoga therapy and hopes to earn her 500-hour certification soon. 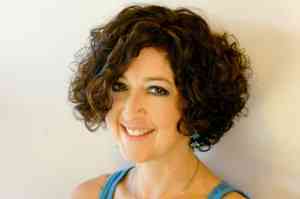 Learn more about Lisa’s teaching schedule or receive news posts on yoga at www.pranalisa.com and on her Facebook page. Lisa also is a certified holistic nutrition consultant, embracing a functional approach to honor her clients’ bio-individual needs. 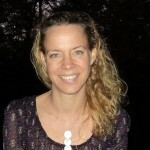 Check out her Holistic Nutrition Facebook page and on her website at www.pranaprogram.com. Janet Raftis, of Totem Guidance, is a Reiki Master that uses it as a means of both facilitating your healing journey and connecting you to your higher guidance. During a session with her, you receive an hour of healing that helps you to release past life and early life blocks and patterns that are holding you back from fully expressing who you are. She can help you to cut the energetic cords that bind you to trauma and relationships that cause you to feel fear and which keep you from fully connecting to your life purpose. Janet receives guidance throughout the session from your spirit team, including animal spirits, angels and your personal guides. This unique messaging provides you with insights into how to shift your thinking and emotional responses so that you may more fully enjoy your relationships with others and find the career path that aligns with your higher purpose. Each session wraps up with a thirty minute discussion of the guidance and you also receive a write-up through email.